Brrr...it was cold today. The last day of summer, we chilled at 47 degrees for the high. Definitely soup weather. I was in the mood for something different, so tried a Thai Soup. I found this recipe over at Tasty Kitchen and made only minor adjustments. Michael says this is his new favorite soup. In a stock pot, heat 1 TBS olive oil. Stir-fry onion & garlic until tender. Add Cilantro, coconut milk, chicken broth & red curry paste. In a skillet, heat 1 TBS olive oil and add chicken. Sprinkle with salt and pepper. When no longer pink, add ginger, mushrooms, green onion, jalapeno pepper, bean sprouts and grated lime zest. 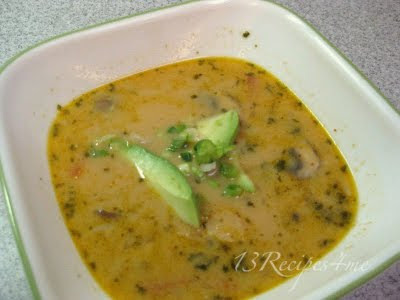 Remove from pan and add to broth/coconut milk. Squeeze juice from lime into soup. Simmer gently for 10-15 minutes. To serve, garnish with slices of avocado and sliced green onions.